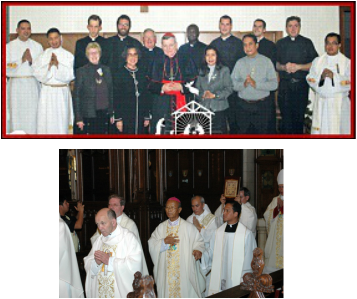 Top Photo: ICR 2011 at Rome, Italy with Raymond Cardinal Burke, center, from left, Fr Jose Viola, OATH, Fr. Bing Arellano, Spiritual Director of OATH, Fr. Michael Houser, Fr. Aaron Nord, Fr. Martin Mannion, Fr. Augustine, SMP, Fr. Rodger Flemming, Fr. Mark Chrismer all from Archdiocese of St. Louis, Fr. Jeffrey Stone, Archdiocese of Springfield, Fr. Frances,OATH., Janice Pohlmann, Ester Figueroa, Ruby Casino, and Noel Casino, OATH Third Orders and Promoters. If you would like to celebrate First Friday vigil mass at Ascension Catholic Church, Chesterfield, All Saints Church, University City, or St. Anthony Padua, Quincy, Illinois. Please e-mail to ncasino@smnpm.com and let us know what month would you prefer to celebrate a vigil mass. We all welcome all the priests. We thank GOD for your commitment, love and spiritual guidance. Info: First Friday vigil mass is celebrated at 8:30 pm and First Saturday vigil mass is at midnight following First Friday mass. 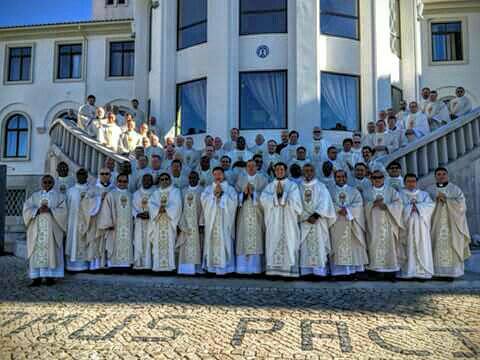 (We have several priests that have celebrated the Alliance of the Holy Family Vigil and are not listed here. We apologized and would like you to send us an email at jmj@ath-stl.org if you have celebrated mass with us.